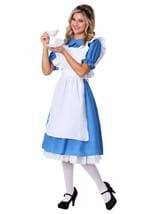 Spice up your Alice costume with these thigh high stockings! The black and white striped stockings are made from nylon and fit weights between 90-160lbs. Look great with our mary jane shoes! One size fits WT. 90-160 LBS.